A perfect example of 18th century alms houses, this example was erected in 1720, altered during the early 20th century, and restored to near perfect condition in 1974. The alms houses and the small chapel at the rear of the yard are surrounded by a rubble boundary wall. The whole consists of two ranges of six houses forming a narrow courtyard with a chapel at the West end. The alms houses were funded and built by William Penny, who was at various times a Lancaster town council member and three times city mayor. 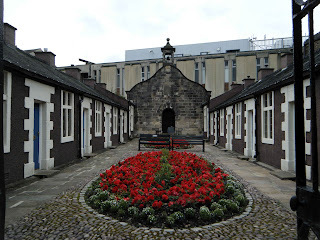 When King Street was widened in the early part of the 20th century, two of the alms houses nearest the road were demolished, the chapel was shortened and two new alms houses were built nearer the chapel.